Wonders as the saying goes shall never cease. It is very amazing to hear cases of child abandonment especially when one considers the fact that children are precious gifts from God. A baby boy who appears to be less than 24 hours old was found abandoned in a deserted path surrounded by shrubs in Ikorodu area of Lagos state recently. The innocent child was welcomed to the world in this most wicked manner by an unknown mother or parents. The baby boy who was neatly wrapped was found in a bush at the early hours of Monday November 26, 2012, along Ikorodu -Itokin road, close to the popular Lucky Fibre bus-stop, Ikorodu. According to residents, the baby was found at about 7am that fateful day by passers-by who were alerted by the cries of the baby. Sympathisers quickly rushed to the scene and saw the baby crying. There was no written note or inscription left by the run-away mother. According to an eye witness, the good Samaritans were afraid to carry the innocent crying baby but on the orders of the chairman of the Community Development Authority, CDA, the innocent baby was immediately taken to the nearest police station. Saturday Vanguard learnt that the child was immediately taken to Shagamu road Police Division, Ikorodu and then to an orphanage. 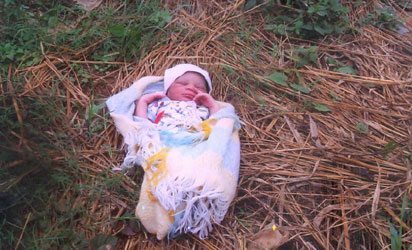 The D.P.O Shagamu Road Police Division, SP Benard Ediagboya, told Saturday Vanguard and anyone who crave any information about the abandoned baby should call the Lagos State Police Public Relations officer (PPRO), adding that investigation had begun on the matter.